Here at Slack we are working to ensure that diversity and inclusion are fundamental components of our organization. Like many other companies, we are reevaluating and revising our recruiting practices. More broadly, we are trying to change the culture that can make Silicon Valley feel like an unwelcome place for many people. Part of transforming that culture includes accountability and transparency. We recently reported our diversity and inclusion data in September 2015. Why are we reporting it again now? The answer is simple: we got a lot bigger very quickly, we changed our survey methodology to allow for greater inclusivity, and we have seen a shift in our diversity data since last time. In our September 2015 blog post we reported about women managers at Slack. Today, 43% of our managers identify as women, and 40% of our people are managed by women, down slightly from our last report. The black engineering population at Slack has grown to 8.9% of our overall US engineering organization (and over 7.8% globally compared to just under 7% globally in our last report). In December 2015, 6.9% of our US technical employees and 4.4% of our total US employee population identified as black. Technical roles are self-reported but include product, design, engineering, QA and technical account managers. The Hispanic/Latino(a) population was either negligible or obscured by having a broad multiracial category in our first survey. 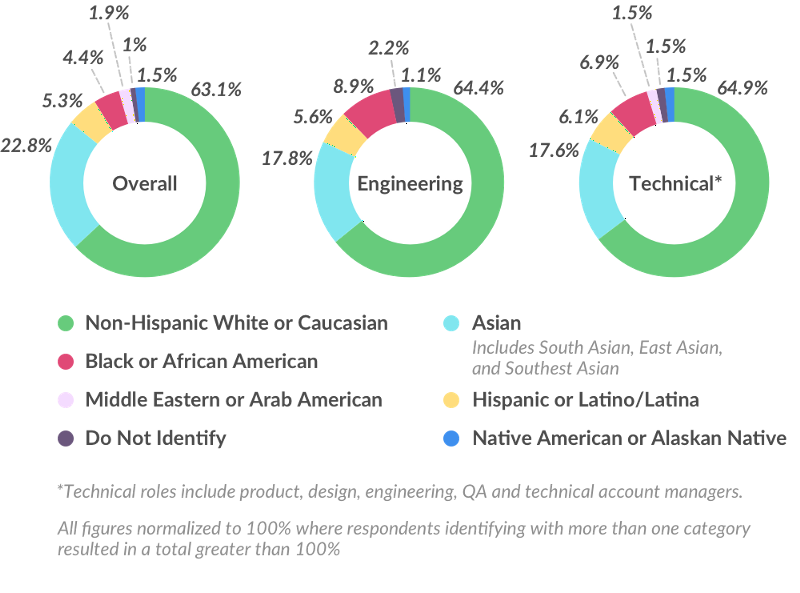 In this most recent survey, 5.6% of our US engineering organization reported themselves to be Hispanic/Latino(a), along with 6.1% of all US technical employees. In our September blog post, 18% of people in our global engineering organization identified as women. That number has risen to 24% today, 26% in the US. Across all departments globally, women are currently 43% of our workforce, up from 39% in our September post. Often not reported among tech companies is the intersection of race and gender. 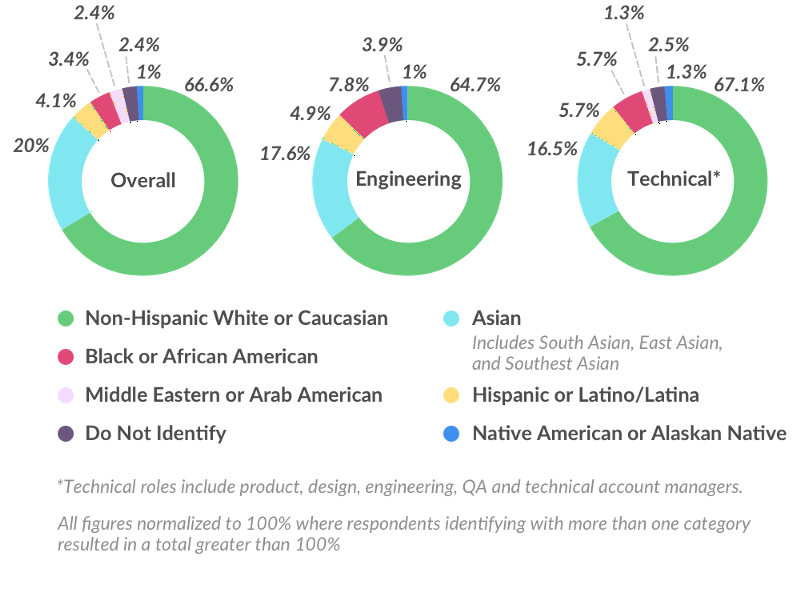 Looking at women within underrepresented people of color (Native, Black, Hispanic/Latina, also frequently referred to as underrepresented minorities or “URMs”) we found that 9% of our engineering organization in the US report in these categories. Our LGBTQ population has grown from 10% of Slack’s global workforce in June to 13% of our global population in December. Our diversity surveys are voluntarily self-reported data from employees. Surveys are anonymous. None of the data we collect about race/ethnicity, gender identity, or sexual orientation in these surveys is tied to data in our HRIS system. Some data pertaining to gender identity comes from HRIS reporting. The June 2015 survey only allowed for single-select on race/ethnicity, due to the limitations of our survey tool. Employees were given the option to select “multiracial” or “other,” and indicate how they would describe their racial and ethnic background. We received very clear employee feedback that a multiselect option was preferable to “other” so we made that change for our December 2015 survey. In both surveys, we did not get to a full 100% participation rate. However, we did get over 90% both times. Note that being short of 100% leaves a margin of error in the results, which could sway the numbers in either direction. All results are therefore approximate. The June 2015 report was based on global data. The December 2015 survey population was larger, allowing us to report US and global data separately. In addition to our headquarters in San Francisco, Slack has offices in Vancouver, Canada, Dublin, Ireland, and Melbourne, Australia. Because we are still small as companies go, every person we hire and every person who leaves can make a dramatic difference to our diversity data. For the most part, we appear to be harnessing our net growth in a positive way, but that could change. Some changes in our results could also be partly explained by the changes in survey design between the two surveys that we ran. We recognize that we still have a long way to go. For example, while there are women leaders in our engineering and technical organizations, there are still no leadership positions in engineering, product or design held by URMs. This is a glaring omission for a company where 13% of the global engineering organization reports as URMs. One way we are starting to address this gap is by introducing the Rooney Rule into our recruiting process as we hire for more senior-level leadership roles. We also recognize that we do not yet have a woman or person of color from an underrepresented group on our board of directors. When we begin to add outside directors, addressing this will be an important priority. All in all, our takeaway from this is that talking about diversity and inclusion keeps the issue front of mind for ourselves and our people. So we are going to keep talking about it. Of course, talk is not enough. We will continue to regularly report on our status so that we can be held accountable, and we will continue to look for ways in which we can improve.